The past few weeks, my anxiety has been through the roof waiting to hear back on some pretty big deal pieces of news that have a significant effect on our family. Well, last week we finally heard back from everything and the time has come where I can finally share! For those of you who don't know, I currently work as the Marketing Director for a cluster of popular bar-restaurants in midtown, all owned by the same three guys (my bosses are pretty wonderful). The thing is, as much as I love my job, my position is only Tuesday through Friday and with baby on the way, I decided to look for another part-time job to supplement my income. Bonus points for something I could do from home/my laptop. Enter: Stitch Fix. A looooong time ago I had applied for one of their Stylist positions and never heard back and then recently, after chatting with a friend of mine about my plans to look for another job, she mentioned how she's a Stylist for them and knew they were hiring again in Sacramento. I jumped on the opportunity and applied, scored an interview and finally after about three months of going through the whole hiring process, am excited to announce I've been officially offered a Stylist position with their team! For those not familiar, Stitch Fix is a subscription-based personal styling service (kind of like Ipsy and Birch Box, but with clothing + accessories). As a Stylist I get to choose the items that go into the customer's monthly Fix. Neat, huh? Training is next month which means I'll most likely start some time in July but I'm so excited--the job seems right up my alley and I really like the women I've met from the company so far. I'm so grateful I found something I'm genuinely interested in which I can also do from the comfort of home, even with a baby on my hip. Next, and probably the thing I'm most excited about is WE FINALLY FOUND A HOUSE! Right now we live in a teeny one bedroom apartment and with our lease up next month, we knew we would be needing to move to make more room for our soon-to-be family of three. We're holding off on buying a house for a couple years until it's more of a buyer's market (not that the rental market is any better). It's SO competitive in our city right now, even just to rent. Searching for a two-bedroom house (not apartment) within our budget seemed impossible. I downloaded all the housing apps, made viewing appointments and we spent our days off looking at places. Nothing was panning out and I was beginning to feel desperate. My maternal instinct to nest and not be able to was killing me. I'm almost six months pregnant with no nursery to put together--I was getting pretty sad, guys. Then one day, Joel sent me a link to a house he found just four blocks from where we are now. A 2bd/2bath Victorian. With a porch. And an upstairs balcony. And a laundry room. And a bathtub(!) And and and...just, everything we had been looking for. Just under our max budget. It was the unicorn of houses in midtown. I immediately contacted the realty company advertising it and submitted our application. Even though it had been listed just one day, I was told there were already two other applications! I knew I had to do something to set us apart. It had already crossed my mind, but with the extra push from my best friend who had just purchased a house, decided to include a cover letter with our application, complete with a cheesy photo of us and all. I busted out the label maker and made a professional file to hold all of our forms. I gave all of our references a heads-up that they would most likely be contacted and hounded everyone to reply ASAP. I checked my credit report and paid down debts. I swear it worked because after a grueling two-weeks of countless phone calls and verifications we finally got the call that we beat everyone out and the house was ours. My hormones leaked out of my eyes and only stopped long enough to call Joel and tell him the good news. We are so happy! We signed the lease yesterday and we get the keys June 9th. 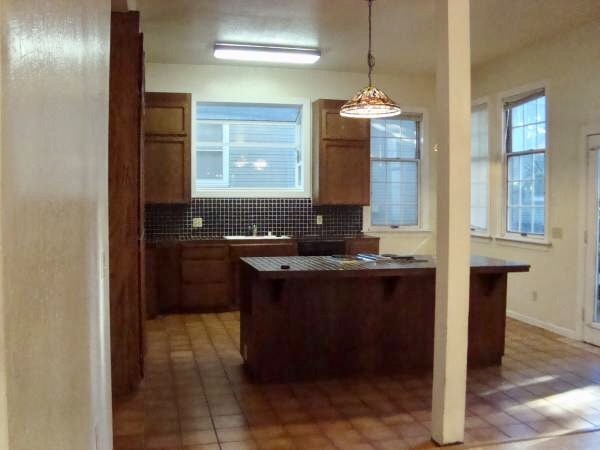 The current tenants are still in there so I didn't take any pictures myself when we went and saw it but here's a couple from the ad when it was listed. We plan to do a few updates but I am absolutely in love with the huge, open floor-plan downstairs. Look at all that natural light! Both bedrooms and the full bath are upstairs--the house totals around 1750sqft so everything is nice and roomy--complete opposite of what we have now. For whatever reason I seem to have relatively good luck when it comes to finding places to move and for that, I am super grateful. I'm excited to make the house where we'll raise our son, a home. Together. The three of us.